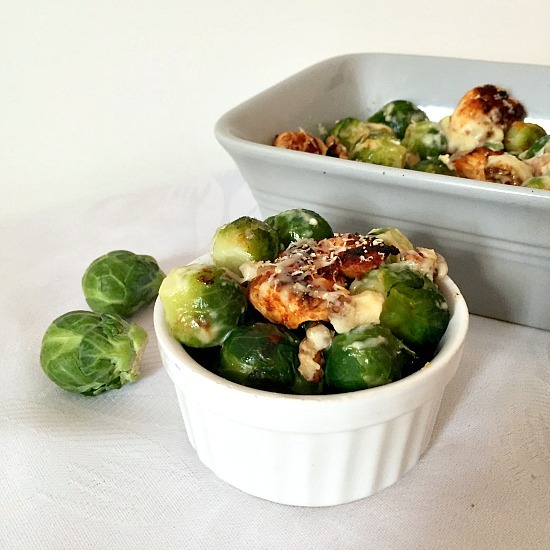 Brussel Sprouts Casserole with chicken and walnuts, a delicious dish for the whole family. A great choice for your Thanksgiving or Christmas dinner menu. Keto, low carb, high protein, this dish is a always a big hit with us. Brussels sprouts are very popular in the UK, many people will say that the Christmas menu would not be complete without them. 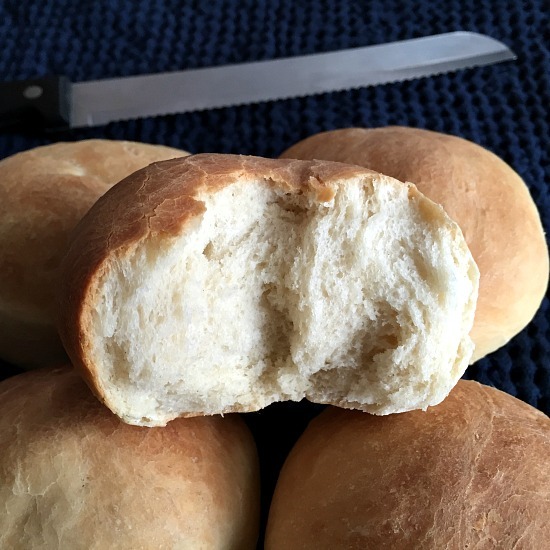 They are a great accompaniment to any roast and can be enjoyed on their own or in stir fries or baked with other ingredients. Brussels sprouts are the mini version of cabbages, have a lovely green colour and a bitter-sweet nutty flavour, being at their best in the winter months. Although you can find frozen ones as well, the fresh Brussels sprouts taste a lot better. Unlike other vegetables, they are quite inexpensive and are easily available in any supermarket. You can eithe buy them fresh or frozen, but either way, they can be cooked really fast. The fresh ones, however, are super tasty once the cold season starts. I don’t really have much of them in summer, as with other seasonal vegetables, I would rather consume them when they are at their best. 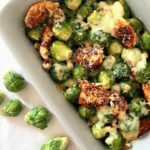 How do you make brussel sprouts casserole with chicken? First, we need to cook the chicken. If you have any leftover chicken or rotisserie chicken, that’s great, this step can be skipped. If not, cut the chicken breasts into pieces, add them to a bag together with the paprika, salt and pepper, and shake well to coat. Grill for 5-6 minutes until cooked through, then add the chicken pieces to an oven-proof dish, and top with grated cheese. Next, make the cheese sauce. Melt the butter in a pan, add the flour, mix well, and slowly pour the milk in whisking continuosly until it thickens. Add the dijon mustard, season to taste, and add more grated cheese. Pour the sauce over the chicken, add the walnuts, then top with more grated cheese, and bake for 10-15 minutes until the cheese is melted. What can you replace the chicken with? You can add cooked bacon, ham, turkey, beef, or any other meat of your choice. 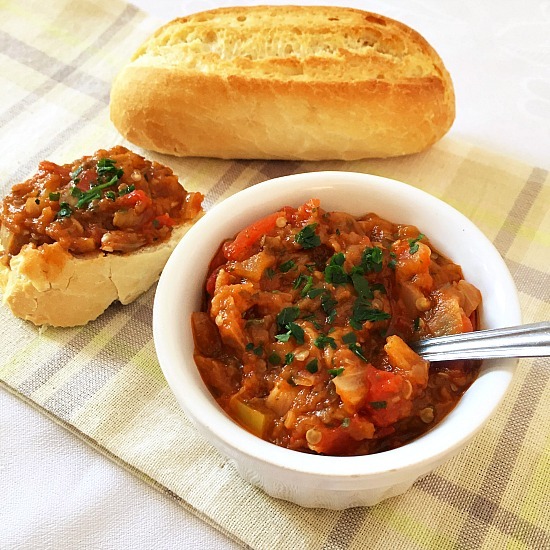 For a vegetarian option, you can add sauteed mushrooms or even meat-free quorn pieces. 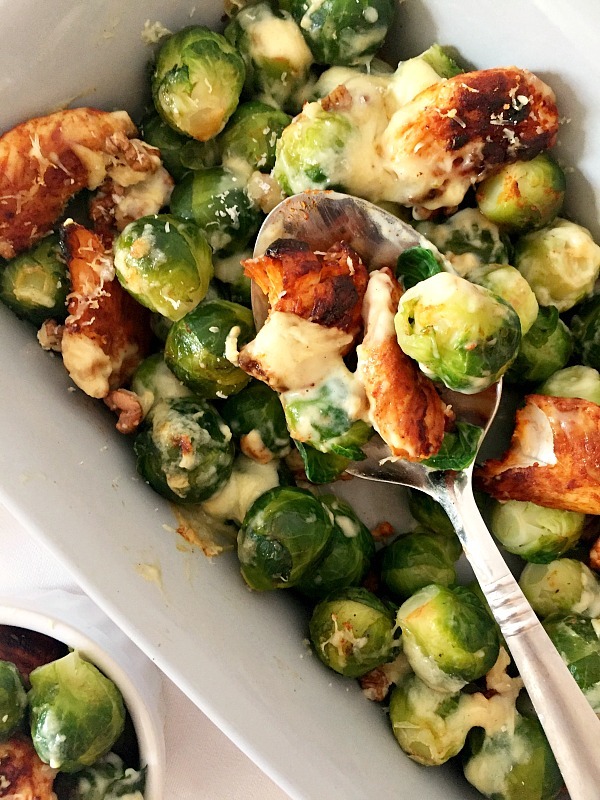 Make sure the brussels sprouts are cooked beforehand, otherwise they will not have time to soften in the oven, since the cheese melts quickly. I was not a big fan of Brussels sprouts, as I was a bit put off by their bitter taste, but, as with many other foods, I got to appreciate them in time. The Thanksgiving or Christmas meal can be quite heavy and some healthy vegetables would be just right. They are rich in valuable nutrients and an excellent source of a whole range of vitamins, including vitamin C and K.
If you buy way too many Brussels sprounts, why not try these Baked Spinach Bites with Brussels Sprouts, even kids will love them. If you’ve liked this BRUSSEL SPROUTS CASSEROLE WITH CHICKEN AND WALNUTS or any other recipe on the blog, then don’t forget to rate the recipe and let me know how you got on in the comments below, I love hearing from you! You can also FOLLOW ME on FACEBOOK, and PINTEREST to see more delicious food and what I’m getting up to. Cut the chicken into big strips, place it in a bag, the add paprika, salt and pepper and close the bag. Shake it so that the chicken can be coated evenly. Add 1 tsp of vegetable oil to a grill pan and cook the chicken until brown. Bring 1 litre of salted water to the boil and boil the Brussels sprouts for 15 minutes or until they are tender. Drain the water and place them in an ovenproof dish. Add the cooked chicken and grate some parmesan and cheddar cheese on top. Chop the walnuts and scatter them over. In a pan, melt a knob of butter and add the plain flour, mixing well until you get a thick paste. Add the milk and stir continuously until the sauce thickens. Add the dijon mustard and pour the mixture over the sprouts, walnuts and chicken. Grate some more cheese on top. Season well with black pepper and bake in the oven for 15 minutes until the cheese has melted. This sounds really good, lots of different textures that would add a nice crunch! I adore Brussels sprouts, and your recipe looks really delicious. We always grew our own sprouts until we moved house to a smaller garden. i must say I haven’t found any we’ve bought to have the same, lovely nutty taste. But you are right, Christmas dinner wouldn’t be the same without them. ou’re also right about how heavy Christmas dinner is. 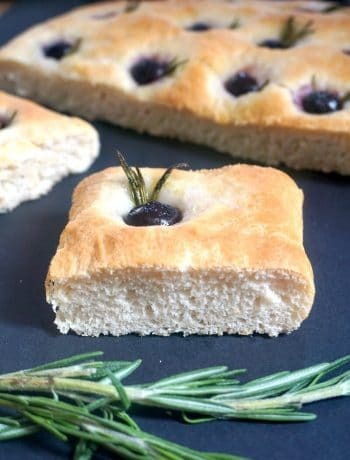 So this recipe would be excellent for sometime over the holiday. I like the idea of using walnuts. i love all nuts! Thanks for this one, Daniela. No idea what a “knob” of butter is and can’t begin to know how much 25g of cheese might be……….other than that it looks pretty good……. Hello, thank you for your comment. In the UK we usually call a knob of butter a small amount, like let’s say a teaspoon or so. I have updated the recipe to reflect the change, as well as the cheese one. If you click on the US Customary link in the recipe card, you will see the measurements displayed in cups and ounces.